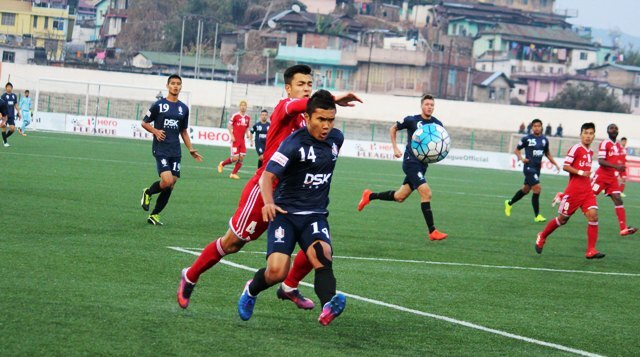 A spirited DSK Shivajians side broke Shillong Lajong’s winning streak at home beating the Reds 2-1 in a well-contested eighth round Hero I-League match at the JLN Stadium in Shillong on Saturday afternoon. Two first half strikes by Sanju Pradhan (16′) and Shane McFaul (44′) sealed the fate of the tie as a strike from Dipanda Dicka (33′) was not sufficient to secure a point for the hosts. Lajong had won four matches on the trot before this and were desperately looking for a clean sweep of 5 home games before they embark on their away campaign yet again. Nevertheless, it was one of the better-contested ties in Shillong which saw the hosts fighting it out till the last minute. Despite the loss, Lajong will retain the fourth spot for now even as DSK, who won their first away match today, strengthen their position at the sixth spot. It was an action-packed encounter from the outset with Sanju Pradhan making early inroads. Pradhan was given room in front of the Lajong box in the fourth minute but his right-footed shot crashed the net. It was Lajong’s turn three minutes later when Isaac spotted Rupert on the right flank and the ball was slotted back for the former to chip one in for Dicka. But the Cameroonian could not reach for the ball. Pradhan displayed his excellence in the 16th minute when he cut past two defenders to chip one in for Narzary. However, a Samuel header took the ball back to Pradhan who tapped it in for the breakthrough. The goal had ensured that Lajong were behind for the first time in five games. Three minutes after the half-hour mark, in-form Dicka got the hosts right back into the game with a shot on target. An Isaac corner kick had gone deep and Samuel slammed it on a defender as Dicka scored off the rebound to send the 5000-strong crowd into a rapture. A minute before half-time, McFaul dealt a decisive blow to make it 2-1. 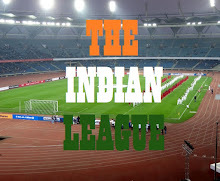 Lajong custodian Vishal Kaith failed to gather a corner kick by Juan Quero as an alert McFaul tapped it in with ease. Crossing over both sides maintained the intensity with Lajong fighting for the equaliser and DSK holding strong to their fortress. A touch unlucky, Lajong missed a golden opportunity to make a comeback when Chinglensana's header off an Isaac free-kick hit the top of the crossbar in the seventy-third minute. Lajong's efforts were thereafter denied at least on two occasions by the brilliant Subrata 'Spiderman' Paul. An acrobatic Paul first saw off a scorcher by Yuta Kinowaki in the 74th minute and later made a desperate dive on the right to deny a cross from the edge on the right 8 minutes later. In the end, it was a well-earned victory for the visitors who were visibly delighted with the outcome.